Festival On The Hill! will bring summer fun to downtown Dayton – June 22 and 23, 2018. This signature community event, will kick off its third year June 22 at the historic and beautiful Dayton Masonic Center. The festival will commence at 5 p.m., Friday, with two fun-filled days of entertainment and music. The Dayton Masonic Center campus, just off I-75, has 8 acres overlooking downtown Dayton. This location offers easy access and ample parking for summer fun, food and music! 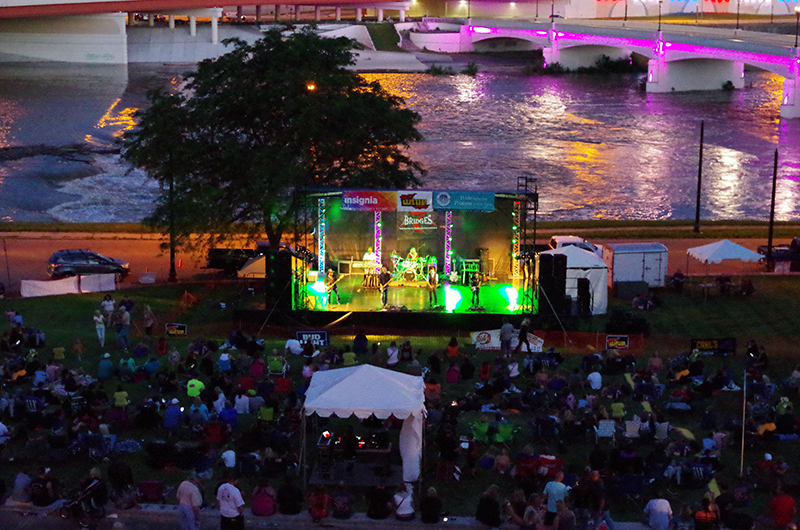 Festival-goers will enjoy open seating on the expansive front lawn, where every seat provides outstanding views of the large main stage and the downtown Dayton skyline. Festival On The Hill! will feature entertainment on the main stage with our own local favorites as well as national touring and recording artists. Wine, domestic and craft beer will be available for purchase and numerous food vendors will be available. Friday, June 22 — 5-11 p.m. Dayton’s largest Happy Hour with live party music, festive beverages and great food. Saturday, June 23 — 3-11 p.m. Bring your family for a day filled with great food and music. Finish the day with one of America’s best tribute bands. General admission tickets with lawn seating prices are $7 for adults, $5 for active military, law enforcement and first responders. Youth under 12 years of age are admitted free with an adult admission. The building is 265 feet (81 m) long by 190 feet (58 m) wide by 80 feet (24 m) high, and encloses 5,000,000 cubic feet (140,000 m3). It is constructed of steel, cement, and stone, including 55,000 cubic feet (1,600 m3) of Bedford stone and 15,000 cubic feet (420 m3) hard limestone and marble from Vermont, Alabama and Tennessee (marble used for interior floors, wainscotings, partitions and stairways). It is a contributing property in the Steele’s Hill-Grafton Hill Historic District, a historic district that was added to the National Register of Historic Places in 1986. The building is also included in a locally designated historic district. By Ohio Law, you must be 21 years of age to purchase and/or consume alcoholic beverages. Upon request, each customer will be asked to present valid identification at the time of beverage ticket purchase. The Dayton Masonic Temple Association reserves the right to refuse service to any customer. Please drink responsibly. Festival On The Hill welcomes Guide or Assistance Dogs utilized by the disabled or visually impaired. All other animals are prohibited. For any auto assistance, please contact the Information Booth and Towing by Carl’s Body Shop at 937.253.5166. For security purposes, only small personal bags (purses, baby bags, etc.) shall be permitted inside Festival On The Hill and may be subject to search at all entrances. Large bags, coolers and backpacks are not permitted. There are no storage lockers on the premises. Please make sure that you leave all unnecessary items in your vehicle. Festival On The Hill will accept American Express, MasterCard and Visa Credit Cards. Credit cards are accepted at select Concession Stands (food and beverage) and at the admission gates. The First Aid Office is located on the main food court behind the building. While at Festival On The Hill, we want everyone to have a great time. Guests using loud, obscene or abusive language or engaging in any other conduct detrimental to the social environment of enjoying a public event will be asked to cease their conduct and may be subject to ejection from the venue if the conduct is deemed overly offensive. Examples of this type of conduct include intoxication, unruly behavior, use of profane or abusive language, inappropriate dress (shirts and shoes required, and offensive or suggestive attire is not permitted), violation of local, state or federal law, behavior that infringes upon other guests’ ability to enjoy the event. Guests are permitted to bring standard lawn chairs into Festival On The Hill. All seating areas are general admission lawn seating with the exception of the restricted VIP areas. Lost or misplaced items can be claimed or returned to the Information Booth located on the main food court area. Festival On The Hill is a rain or shine outdoor event. In the case of severe weather, rain, storms, high winds or tornado warning, you will be notified to evacuate the Festival On The Hill event and grounds. Follow the directions of the Security staff for instructions. No refunds will be given for the purchase of admission, food or beverages sold by the Dayton Masonic Temple Association-Festival On The Hill. This includes beverage tickets as well as admission to Festival On The Hill. Guests may re-enter Festival On The Hill only if exiting through an admission gate and only with the proper hand stamp. Strollers are permitted inside Festival On The Hill providing they do not obstruct the aisle ways. Anyone TRESPASSING on the site will be ejected and subject to arrest and prosecution in accordance with local, city and county law. Umbrellas are permitted at Festival On The Hill. However, please be courteous and considerate when opening them in seating areas. Festival On The Hill security reserves the right to confiscate umbrellas that are being used improperly.